Fragrance aficionados come to Frau Tonis Parfum from all over the world not only due to our extraordinary niche fragrances, but also to create their own individual perfumes in our “scent workshop”. 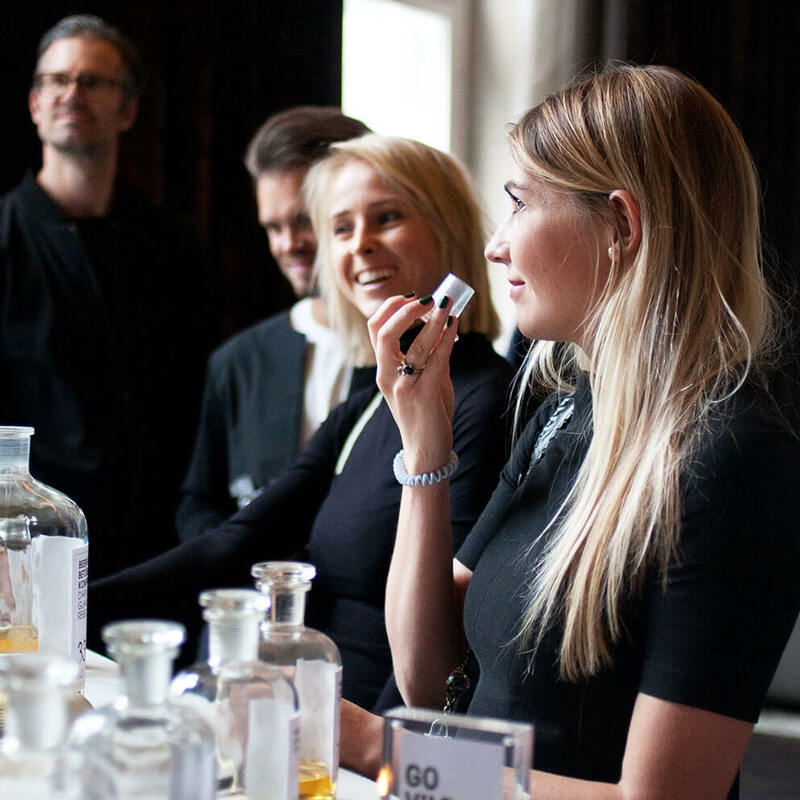 Come to our Berlin atelier to embark on a fragrance journey and develop your entirely personal perfume with our fragrance experts. An intensive dialogue reveals your scent preferences and opens your “olfactory diary”. In the frame of about an hour-long scent journey, our fragrance experts compose your unique perfume – as individual as the character of a person. We archive the recipe of your individual perfumes so that your scent is not only in our atelier, but also available to reorder online or by telephone. Your individual recipe is already created? Then you can reorder it here. At our perfume boutique you will create your customized perfume (50ml) with our scent experts. We serve sparkling wine, fresh fruit and savoury snacks. The store is exclusively available during your fragrance journey. - We complete the experience with sparkling wine, fresh fruit and savoury snacks. - Price: workshop including 50 ml Eau de Parfum: 160.00 Euro per person. - Filing of your perfume composition. Please purchase your voucher for your fragrance journey first and then make a appointment. Please arrange your appointment by phone +49 (0) 30 20 21 53 10 during our opening hours from Monday to Saturday. We are also happy to offer our fragrance journeys on Sundays at additional cost. For those who want to indulge their passion for perfumes with other fragrance aficionados, we recommend a fragrance journey in a group at Frau Tonis Parfum! Get to know all of our exquisitely crafted perfume with other guests and create your own customized perfume with our fragrance experts! - Price: workshop including 50 ml Eau de Parfum: 120.00 Euro per person. After the fragrance journey to the fragrance cocktail in "The Ritz-Carlton, Berlin"
Let’s make it special! Join a fragrance journey with our scent experts at Frau Tonis Parfum and celebrate the creation of your individual perfume with a selected fragrance cocktail at The Ritz-Carlton, Berlin! The fragrances of Frau Tonis Parfum inspired world-class bartender Arnd Heißen to create unique signature drinks. - Afterwards it get your fragrance cocktail at The Ritz Carlton, Berlin. - Price: workshop including 50 ml Eau de Parfum: 175.00 Euro for one person. Please purchase your voucher for your fragrance journey first and then make a future appointment with our scent experts per tel. 030 - 20 21 5310. For larger groups (starting at 6 persons), please contact us per telephone or mail and we will gladly submit an offer. Inquiries and bookings per tel. 030-20 21 5310 or by e-mail.